Powers/Abilities: Very resourceful. For a mouse, he's about as fit as you can get. He knows several Martial Arts, and can speak virtually all known languages. History: "He's The Best. He's The Greatest. He's The Greatest Secret Agent In The World! He's The Ace - He's Amazing... He's the Strongest... He's The Quickest.... He's The Best!" 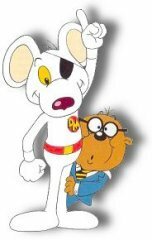 Danger Mouse was the World's Greatest secret agent, a mouse of many talents. Apparently born halfway up Mount Everest, he displayed his exceptional nature early in life, completing the climb to the summit of the world's highest mountain when he was only a few hours old. In spite of his foreign birthplace, DM is a true English gent, and was educated at Eton, Cambridge, Oxford, Harvard, the Sorbonne and Würtembery, picking up his B.A., B.Sc., M.A., M.Sc., and Ph.D along the way. Naturally, he used these varied skills to become a government agent, defending Queen and country. Somewhere along the line he lost or injured his left eye, but he wears an eyepatch so well that no one really thinks to ever mention it. He set up residence in a red pillar box located outside 221B Baker Street, London, home of another famous British hero. When danger threatened the world, he was contacted by his superior, the chinchilla Colonel K, who would issue him with his mission. 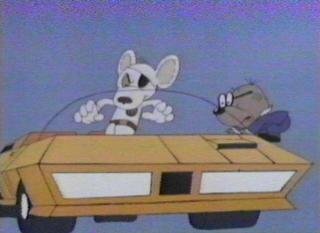 Then Danger Mouse and his trusty, if incredibly incompetent assistant Penfold (a hamster codenamed the Jigsaw, because, when faced with a problem, he goes to pieces), would set forth in their distinctive flying car and save the day. 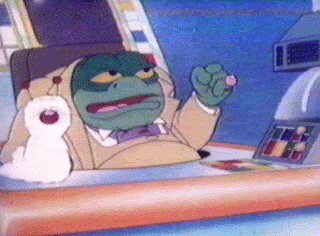 His recurring nemesis was the toad Baron Silas Greenback and his crow lackey Stiletto; however he also faced the vampire Count Duckula, the mad composer Wufgang, the extra-terrestrial JJ Quark, Mexican El Loco, mad scientists Professor Crumhorn and Dr.Frankenstoat, and DM's own evil doppelganger, among others. Have You Fled Any Good Books Lately? In May 1982 the character began a comic strip run in Look-In Magazine, written by Angus P. Allan and drawn by Arthur Ranson, which continued until November 1985. He also starred in six Danger Mouse Annuals, as well as several one-off hardback volumes. There is an excellent Danger Mouse website at www.dangermouse.org. Also there is a website devoted to Cosgrove Hall, including excellent stuff on this character here. Back to General UK Heroes. All images and characters depicted are copyright their respective holders, and are used above for informational purposes only. No infringement is intended and copyrights remain at source.